By all accounts, Bill Keys got along pretty well with most people but was not a man to let anybody run over him. He once said, "if the law won't uphold me, I'll uphold myself." And it appears that is just what he did on May 11th of 1943. Some time during 1938, an ex-sheriff from Los Angeles by the name of Worth Bagley moved into the J Tree area. Depending on which story is told, he left the police force either for health reasons or because of repeated abuses of power and mental instability. In any case, he quickly gained the reputation of being trouble, constantly armed and generally in a foul mood. Unfortunately for Keys, Bagley purchased a piece of property which bordered Keys' Desert Queen Ranch. The two men did not get along and Keys often found his cattle shot near their common boundary, but could never prove that Bagley was the shooter. The bad blood truly came to a boil when Bagley began blocking the road Keys used to access his Wall Street Mill. Bagley claimed the road passed over his property and refused to let Keys pass. Keys claimed the road was public access for years and he wasn't about to quit using it. On one return trip from his mill, he found a sign posted near Bagley's property which reportedly said, "Keys, this is my last warning. Stay off my property." After reading the sign, Keys spotted Bagley in the distance with a gun in his hand. An old west shoot-out is what followed. Keys grabbed his rifle and waited for Bagley to open fire. When he did, he missed. Keys didn't. Keys turned himself in to the authorities later that same day and his case came to trail some seven weeks later. It did not go well for Bill Keys. Evidence may have been tampered with and "expert" witnesses may not have been so expert. Keys was convicted of manslaughter and sentenced to ten years in San Quentin Prison. Luckily for Keys, he had had the good fortune to meet Erle Stanley Garnder (creator of Perry Mason) during the late 1920s. Gardner championed Keys' case for parole and the California Adult Authority finally concluded that Keys had been wrongly convicted. He was given a full pardon and in 1948, he walked out of prison a free and cleared man. Keys returned to his Desert Queen Ranch and lived there for the rest of his life. At some point, he carved the stone which stands along side the trail to the Wall Street Mill. The stone marks the site where Worth Bagley "bit the dust." The green paint was added some time later by vandals. You can find this stone marker along the trail to the Wall Street Mill, somewhere along the stretch between the Desert Queen Well windmill and the Wall Street Mill. As there are several parallel trails to the Mill, it sometimes take a bit of searching to find the stone. You'll see some bits and pieces of barbed wire fence every now and then. I always wonder if it was part of a fence put up by Bagley to keep Keys from using the road. Addendum 5/2016: The stone marker apparently no longer stands along the trail. My understanding is that it was broken by vandals and has been removed by the park service for safe-keeping. The new, replacement Bagley marker at the original location. Park cultural resource staff recently installed a to scale replica of what is known as the Worth Bagley Marker. The original marker was placed on the site of the 1943 shootout between William F. (Bill) Keys and Worth Bagley and stood on the side of the trail leading out to Wall Street Mill. The original stone was vandalized in 2014 and is now in the park’s museum for safekeeping. Using a combination of photographs and detailed measurements, artist, Rebecca Lowry of JTLab was able to recreate a design as close to the same outline and lettering of the original as possible. The project was a collaborative effort which included park staff, JTLab, Vagabond Welding and the descendents of Bill Keys. The marker, which is fabricated from ¾ inch steel, will show visitors the site of one of the truly historical events in the history of the park. Keys maintained in court that Bagley ambushed him along the road and he returned fire in self defense, killing Bagley. In spite of his testimony, a court found him guilty of manslaughter and Keys was sent to San Quentin State Penitentiary. He was released in 1948 after serving 5 years of a 10 year sentence. 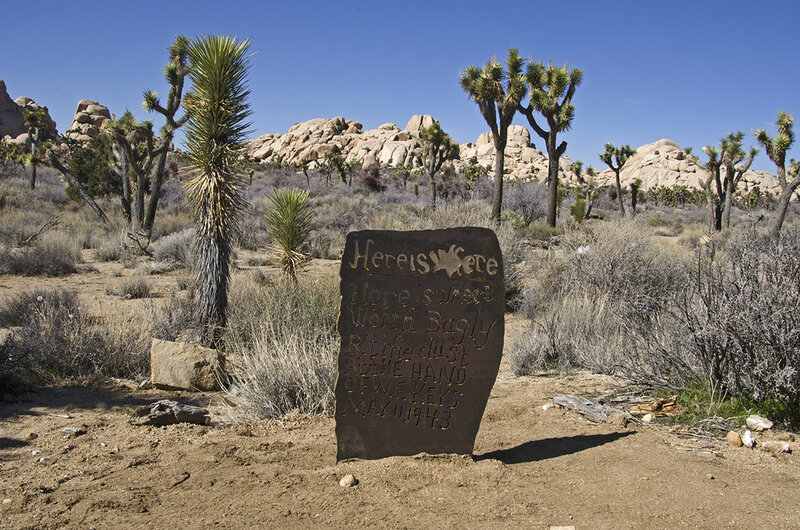 Keys returned to the Desert Queen Ranch where he lived out his remaining years and placed the marker on the spot where the gunfight occurred. Bill Keys was granted a full pardon in 1956. I think it’s awesome that the park created this replica to keep the history of this area alive for visitors to see. Hopefully it might inspire some to do some research and learn more about the amazing Bill Keys.